The engagement ring warranty is made to protect you from any potential design or manufacturing flaws. As a large value purchase, these rings are typically insured and valued according to the market price. If you purchase a ring, only to have it break within a year or two, it goes without saying that you will want to recover your losses. Most warranties cover any issues that do not fall under wear and tear or any damage caused by accidents, hazardous activities, loss or theft. Most reputable jewellers will replace or refund the value of the ring if the fault lies in the manufacture of the engagement ring. Warranties are a good reflection of quality. If you purchase a ring from the cheapest possible outlet, such as a price match comparison website, for example, or a large jewellery retail chain that specialises in budget rings, you may save a few Rand, but you will likely not have the assurance that your ring was made to last. A reputable jeweller, on the other hand, knows that a warranty is a reflection of their craftsmanship. Not only will you have a warranty that covers any manufacturing defects, but you will also have an expert craftsman who is able to repair and restore any breakages that may occur over the years. Be very wary of any jeweller that does not offer a warranty as a standard part of the ring purchase. Warranties give you peace of mind. 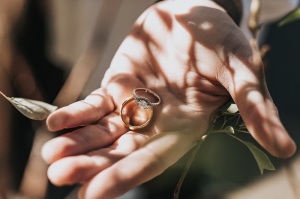 Whether you are buying a ring as a surprise for your future wife, or you are choosing a ring together, this decision is not always without its stress. This type of ring is an investment, and, as such, it should not be purchased in a hurry or on the spot. Add-on services such as warranties and diamond certification papers will help take away some of the worries, giving you peace of mind that you have chosen the right person to create this special piece of jewellery. Be wary if you are ever pushed into making a purchase without any sort of certification, warranty or paperwork. With that said, it is also good to understand that this type of warranty is unique. Unlike a television or appliance, these rings are made to be worn day in and day out. They should always be made to withstand a relative amount of wear and tear. A price match guarantee will put your mind at rest, but what will add even more peace of mind is a ring that is made to last. Choosing a ring designer that makes custom made rings that use the highest quality metals and stones, and designs that will not easily catch, break or fade is the best way to be sure that your ring will last through each decade. 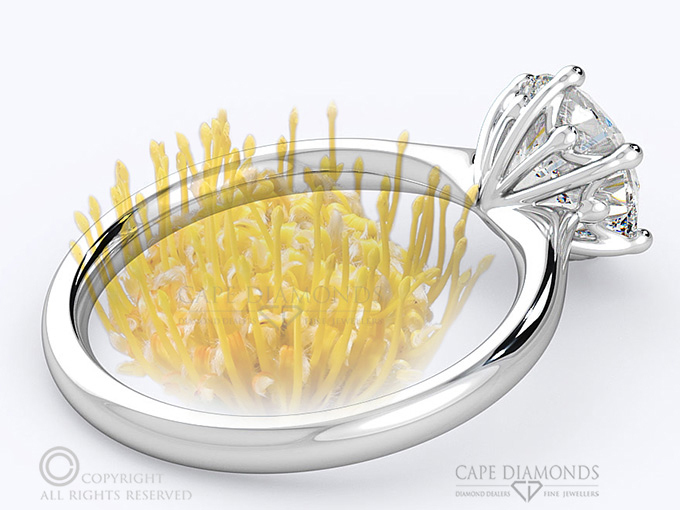 All rings designed and crafted by Cape Diamonds is protected under warranty. To learn more about our return policy or our approach to engagement ring quality, feel free to contact us today. While many consider the larger details, sometimes the smaller details can add the most impact to your engagement ring. 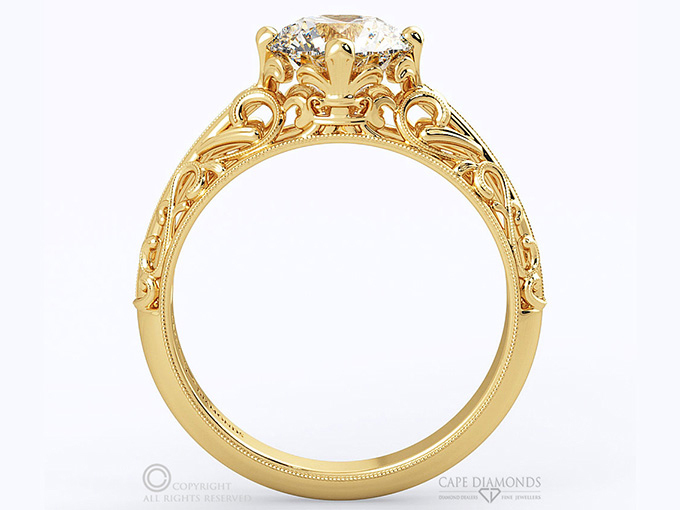 Profile detail applies to the design that can be seen when the ring is viewed from the side. Historically, the primary detail in ring design came through the setting, the stone and the band. Profile detail has gained popularity in recent years, helping to add something extra to rings without going over the top. Ensuring that your ring looks incredible from all angles will mean that you won't want to ever take it off. Keep reading to get some ideas on how you can add profile detail to your engagement ring with a design that looks amazing from any angle. 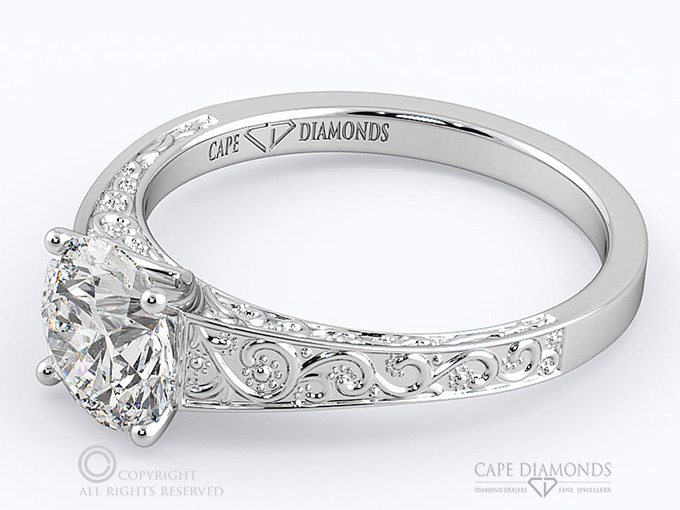 Adding profile detail is a great way to add more impact to your engagement ring. These gorgeous rings featured below have plenty of detail in their profile that adds even more beauty to the overall design. 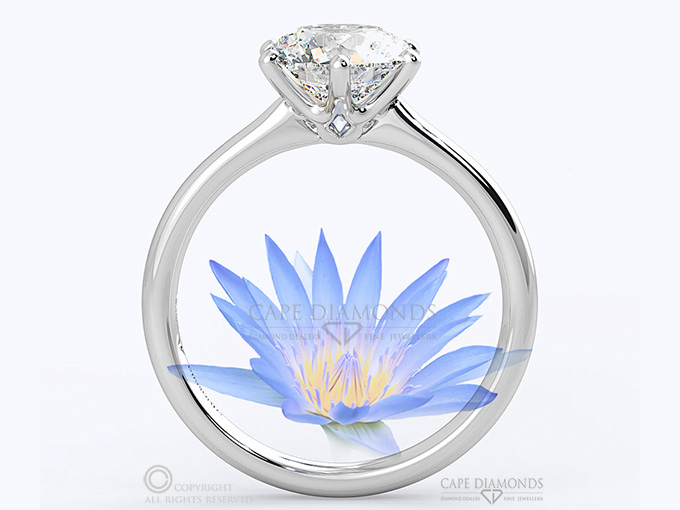 Rising up through the mud to bloom radiantly, the water lily is a symbol of hope, resilience, beauty and perseverance. 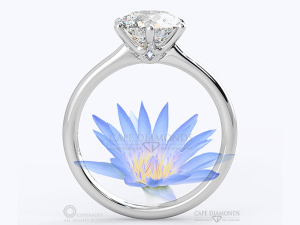 The lotus-style setting of this water lily ring gives it a unique profile that is sure to appeal to brides who have a love for symbolic, deeply personal ring designs that are eye-catching from any angle. This ring is available in platinum, white gold, yellow gold and rose gold, with a choice of plain or pave band. For even more detail, try a coloured diamond or a vibrantly coloured ruby or sapphire instead of a diamond. The pin cushion protea is found across the Cape. 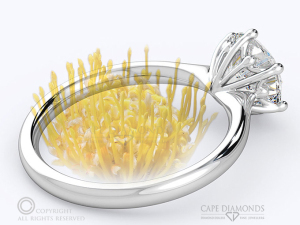 This hardy fynbos plant has an elegant shape that is reflected in the form of pin-like points. For nature-lovers seeking an unusual ring that is elegant, sophisticated and pretty while still being feminine and surprisingly subtle, the pin cushion ring is perfect. This ring is available in a variety of metals. Add more impact with a brightly coloured stone that further enhances the floral feel of this ring. 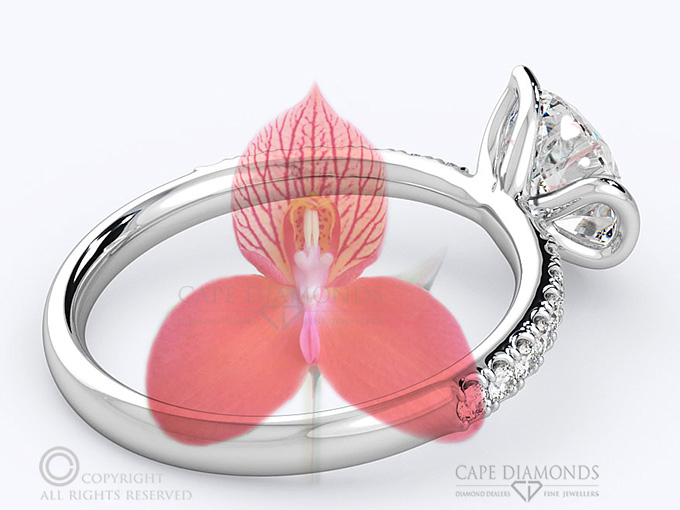 With its delicate petals and simple shape, the disa orchid is South Africa's most iconic floral symbol. 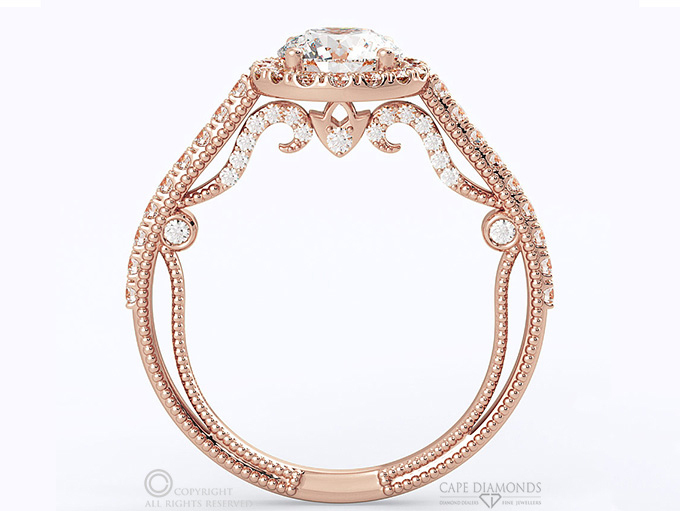 In this disa orchard ring, the soft petals form a gentle floral inspired ring that is romantic, feminine and graceful. Pave stones add further detail. Whether chosen in platinum, yellow, rose or white gold, and diamonds or any other stone for the pave side stones and centre stone, this ring is a stunner. For something intricate and delicate, the ornate halo ring has a truly unusual profile that adds plenty of visual detail. Working especially well in rose gold and diamond, the variations of this ring are endless. Try coloured diamonds and yellow gold, platinum and emerald or sapphire, white gold and diamond, or even something soft, warm and pretty, such as morganite and rose gold. Those who favour a vintage style will adore this exquisite antique filigree ring, which has a beautifully intricate detail that uses filigree to create plenty of impact without being over the top. In gold, the effect is dazzling. This style would work equally well in platinum, white gold or rose gold, with a coloured stone or classic diamond. In the organic collection, the subtle detail on the engraved plant motif ring adds impact without overshadowing the centre stone. This ring is undeniably romantic, appealing to brides who favour a soft, feminine style. It is especially subtle in platinum and white gold but would work well in rose gold or yellow gold, too, for those who want something a little bolder. 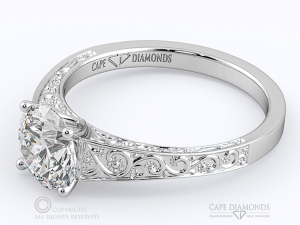 At Cape Diamonds, we offer a wide range of heavenly rings that appeal to every taste and budget. View our full collection to find your dream engagement ring today.